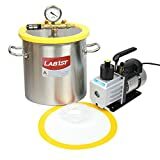 In this episode, we will be follow the last video where we unboxed and discussed the use of a vacuum chamber to dry our filament. In this episode we will take a closer look at the mechanics of this works, what should we expect and which temperatures we need to hit for the best results! ← Design Talk – Easy Hobby Machinist Centering Jig!